"The day we change the clocks” … Children learn the why and when. 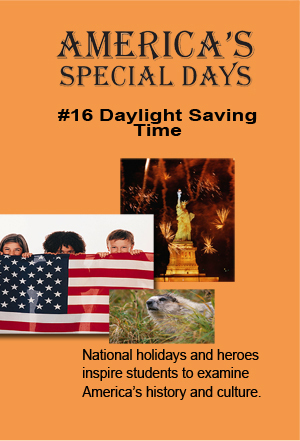 Examine the history and practice of daylight savings time. The British narrator explains how time zones function in relation to earth’s orbit and how global time zones begin at the first meridian in Greenwich, England. The episode features dozens of clocks, form tiny Swiss clocks to the stately Big Ben and then takes viewers to a charming clock maker's shop. We learn how Ben Franklin “invented” daylight saving time to conserve energy, and we also find out which U.S. States don’t observe daylight savings time today.